Where do you stand on the Mumbai vada pav versus samosa pav debate? 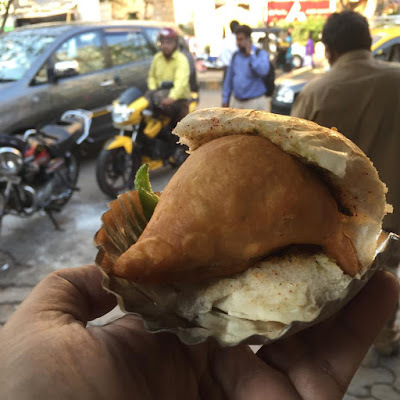 The sales of samosa pav and bata vada pav, I am told, match each other at Shree Krishna snacks where I often go for an evening vada pav when I am at Kalanagar in Mumbai's Bandra East. I have always been a vada pav person ever since I used to stop at the batata vada stall in front of the LIC office. This was while walking from Nariman Point to Churchgate on my way back from work during my early days in Mumbai. The energy bursts of the piping hot, freshly fried batata vada (potato chops) served in soft bread was just the fuel one needed before talking a crowded train back home. The office I used to work in at Nariman Point didn't have much of a canteen. They only served Maggi noodles, a dish gruesomely massacred by office canteens in Mumbai, and samosa toast. In the latter they would put a samosa between two slices of bread and smash and grill it in a sandwich toaster. I quite liked that and would often call for it when at work. This samosa sandwich is different from a samosa pav where a samosa is put in a soft bun and served. The samosa is whole there and not smashed unlike in the grill sandwich. Various offices that I worked in Mumbai would often call for samosas from vada pav shops when they had pujas etc in office. I never liked those. Firstly, I would fondly remember and miss the rolls and biryanis that they would call for on similar occasions in the office at Calcutta where I had started my career as a market researcher. Secondly, I found these Mumbai samosas to be too gargantuan in comparison to our petite Kolkata shingaras. As my Twitter chat with Prosenjit reminded me, the Kolkata shingaras and chops have fried peanuts in them. The gives a nice crunch in between the potatoe love. In winter they add cauliflower to samosas in Calcutta and they are called fulkopir shingara. The crust would be too thick here and too crunchy and the potato filling would be mashed and too spicy. Very different from the pleasantly spiced chopped potato filling in the Kolkata shingara which had a much nicer texture too because of the bites of the cubed pieces of potato. There are two places where I like samosas in Mumbai. One is at Punjab Sweets in Bandra where they make what I assume are Punjabi style samosas freshly fried through the day. The crust is thinner and crisper than the average Godzilla Mumbai vada pav shop samosas and the potato filling is not as over-spiced either. In my younger and slimmer days I would often pick a samosa and 50 g of jalebis from Punjab Sweets to have with coffee at home as breakfast on weekends. I recently had a nice version of this samosa at the Social, Khar, Punjabi paratha, samosa, lassi and chai breakfast combo. Another place where I like samosas are in the old single screen theatres in Mumbai where they sell packs of two samosas in a small paper bag. The bags are labelled A1 samosas and I am told the samosas are made in a shop called Gurukripa in Sion or Chembur. These have a thin, crisp and yet flaky crust. The potato filling is mediocre but the fun lies in the crust. When we were dating, K and I would fight over who would have the crust while watching movies. She would have just the crust and leave me with the potatoes in the samosas! You don't get these A1 samosas in modern multiplexes but you get them in theatres such as Globus or Suburbia in Bandra and I assume in the Gaiety Galaxy complex. I still eat these when I go for movies here even if they are during times when I am trying to diet or have already had dinner and have come for a night show. Coming back to the samosa pav, I finally tried it the other day as the batata vadas were lukewarm at Shree Krishna and I would have to wait for a while to get fresh batata vadas as they were frying them still. To cut a long story short, I didn't like the samosa pav even though it does have its loyal fans. The samosa was too big to eat it in one bite. The crust too hard. The squishy potato filling too spicy in comparison to that of the batata vada here. It was so spicy that I had to have a bhel with sweet chutney from the stall next to Shree Krishna to calm my taste buds. Interestingly the samosa pav cost Rs 14 versus Rs 12 of the batata vada. Vada pavs used to be Rs 1.50 when I first had them in Nariman Point in '99-2000! I realised that samosa pav is not for me. At the most, the samosa sandwich in a griller option where the samosa is flattened works for me. Not the samosa pav. I definitely prefer the vada pav or even the bhajia (slices of potato deep fried in a besan or gram flour batter) pav. The batter coating in a batata vada is a lot thinner which allows you to enjoy the potato filling better. The spicing is milder which allows you to revel in the mult-sensorial spice palate where bursts of heaty green chilliies, pungent garlic & the crunch of mustard seeds come together in symphony. I did a poll on twitter after I had the samosa pav and I saw that I was not alone in my preference for samosa pav. 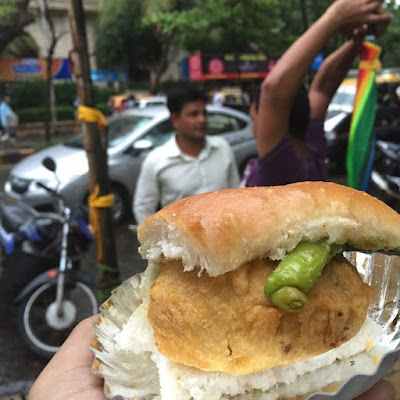 I would love to know where do you stand on the vada pav versus samosa pav debate. While talking of pav I wonder if it struck you how integral the pav is to Mumbai's street food culture? 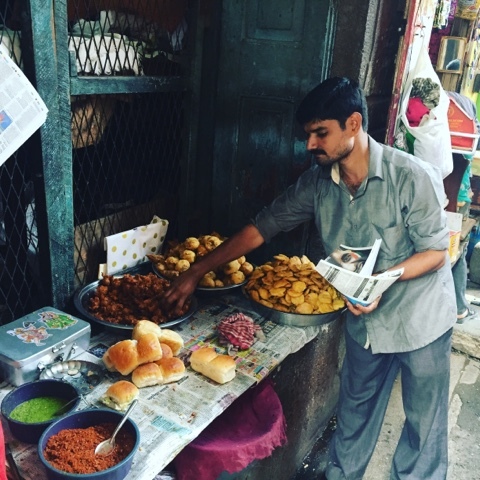 Vada pav, missal pav, pav bhaji, samosa pav, bhajia pav, the pav features almost everywhere, and to think that the pav (soft bun) was a Portuguese introduction which the local Maharashtrians took a while to allow into their homes! Do check out my recent article on this in my India Food Network weekly column here. The other interesting question is whether it should be spelt pav or pao? I used to write the latter till I saw the former in articles. Again I got an answer to this on twitter. @Finelychopped both correct :) Pao more of a Goan spelling as per pronunciation, and pav, as per Marathi, hence more common in Bombay/Pune. If this discussion has left you intrigued then I will leave you with some of the comments I got on the Facebook Finely Chopped page. Please follow me there and on twitter (@finelychopped) for such food chats. And do have some vada pav. Or samosa pav. And don't forget to tell me which you prefer? Nishant Shelar Jeenit Jain he finally tried samosa pav of shre krishna! Nishant Shelar Must've been a bad day in the office for them! Otherwise their samosas are best in bandra. Nishant Shelar Will try punjab sweets samosa asap! Smita Karmokar For me both equally yummy..and btw..carbs and grease bina taste kahaan re baba. Bhavesh Sanghavi Try Graduate Wada Pau outside Byculla Station..
Janaki Viswanathan Vada Pav always! Paridhi Bhushan Roy Vada Pav! Vada pav all the way. Samosa without the pav - samosa has a thick enough crust.